The last few weeks since my visit to Prodrive seem to have been non stop in all aspects of my life – I have a few things to blog about and others will come to light soon. However, today was an important milestone for Owen (and me) – it was Owen’s first ride in the MR2! 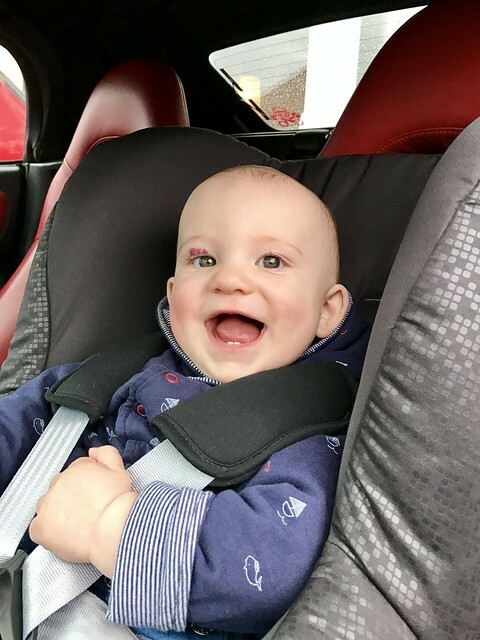 I had been excited about sharing my love of sports cars with him ever since we found out we would be having a baby, so I was relieved that Owen seemed to enjoy it. I think he especially enjoyed being sat next to me and able to see where we were going. One project I have been working on recently is this blog – you may be able to see a few subtle changes, but the big one is that I have moved it to a new server (Amazon EC2 for any other geeks reading), so there may be a few glitches to iron out. Once those have been sorted there will be a few more tweaks and updates. I haven’t been doing too well on the goals I set myself in my new year post, although my weight has been less than 90kg for over a week, so I’m on my way to the first goal. Hopefully after that some of the others will start falling in to place. This entry was posted in Blog, Owen and tagged iPhone, MR2, Owen, Photo by Lewis. Bookmark the permalink.